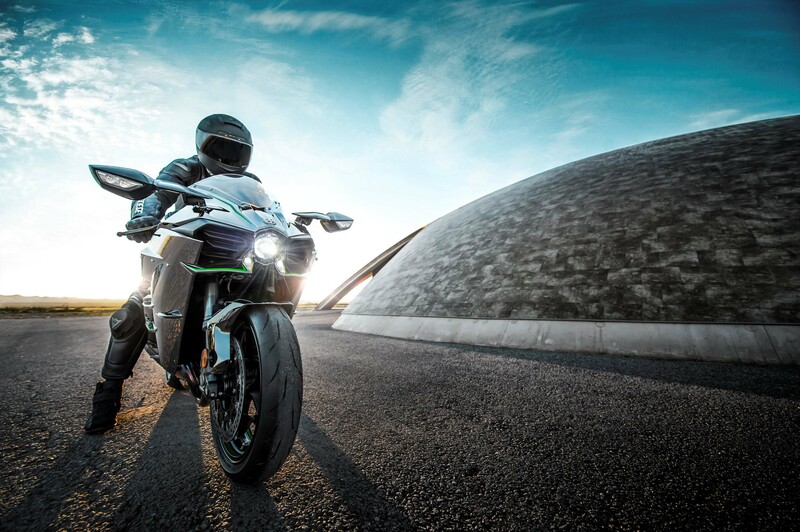 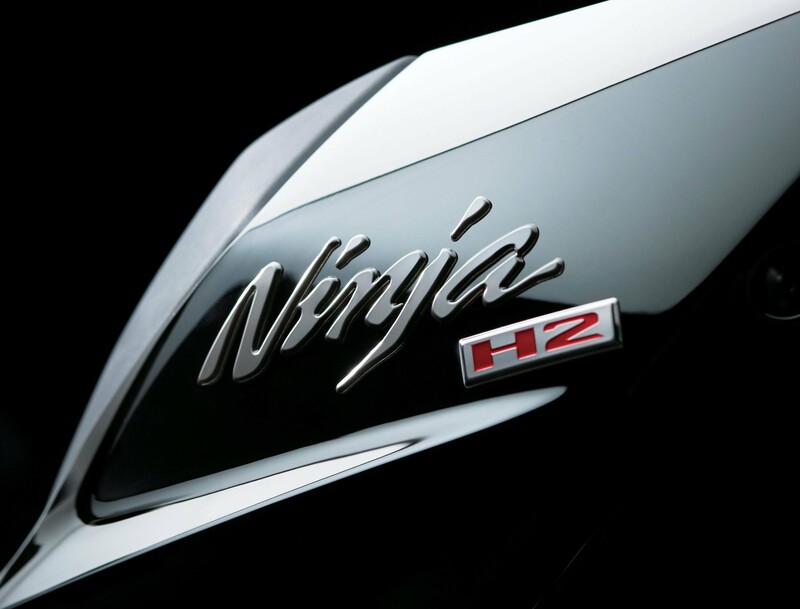 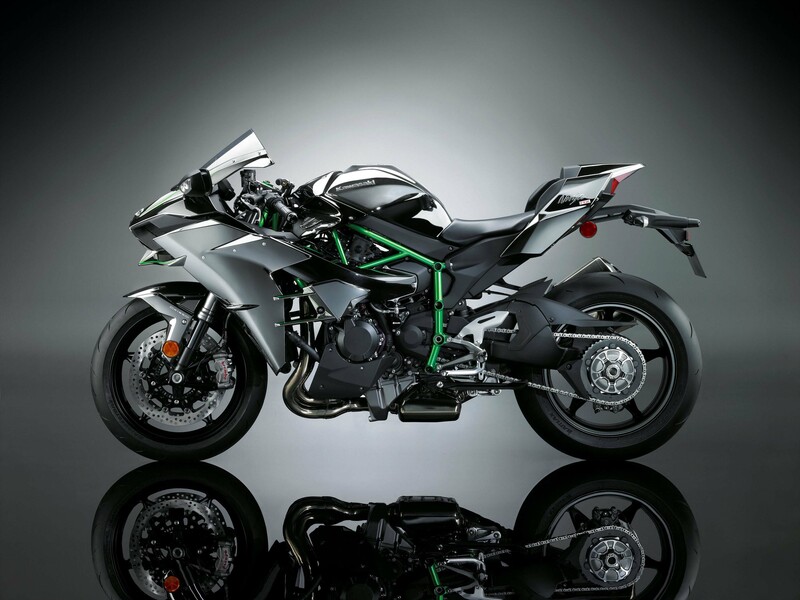 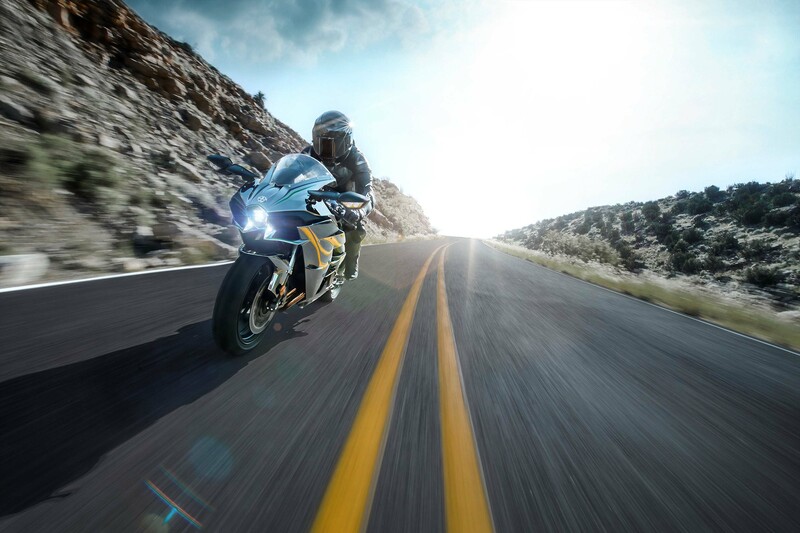 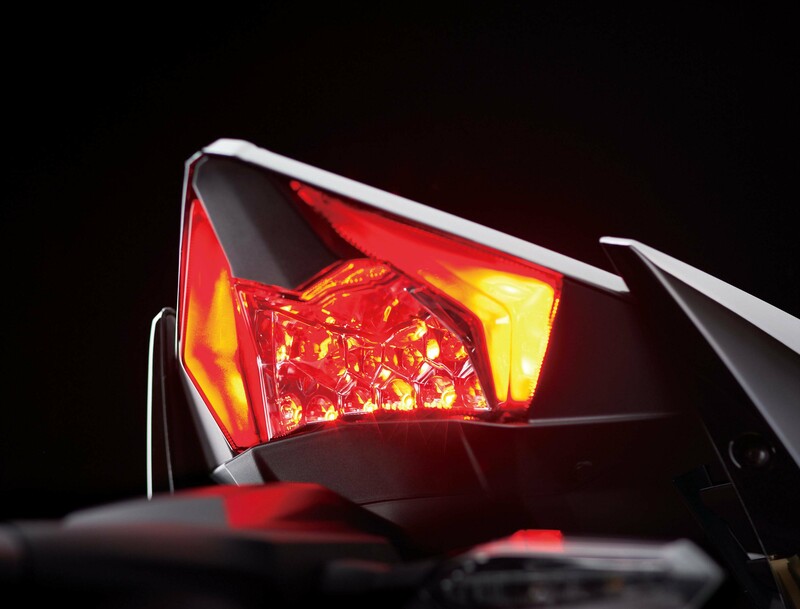 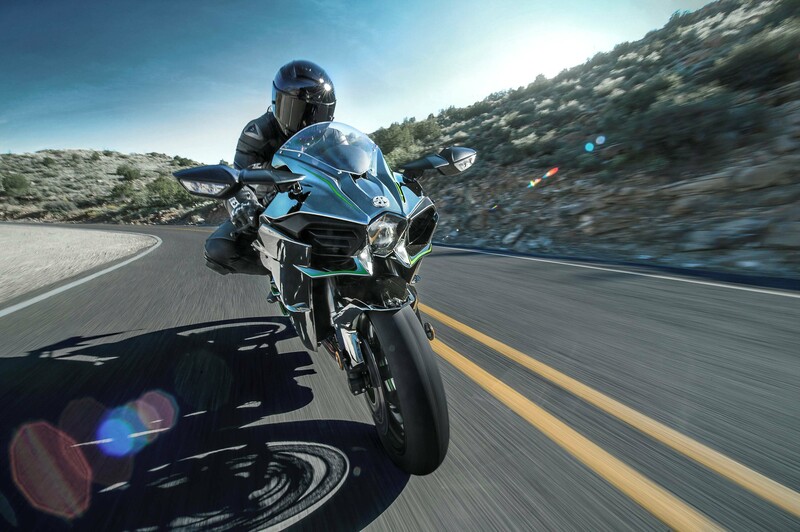 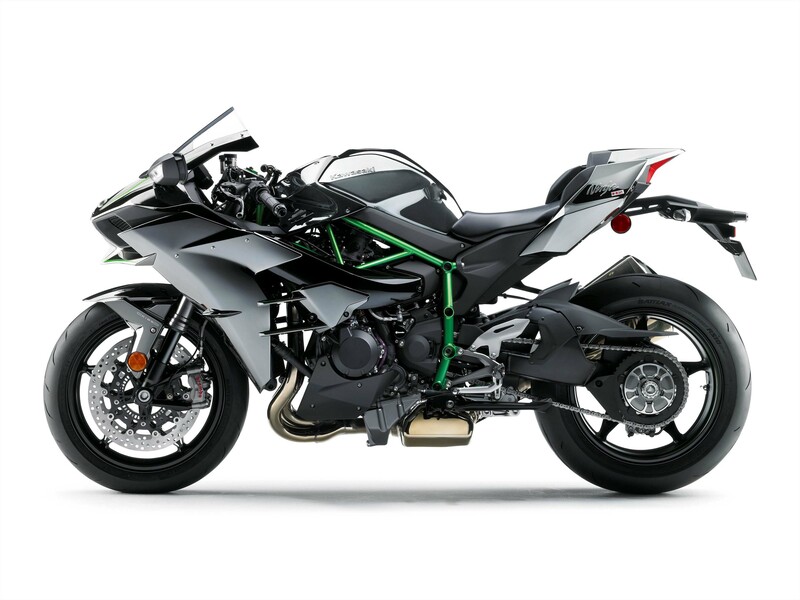 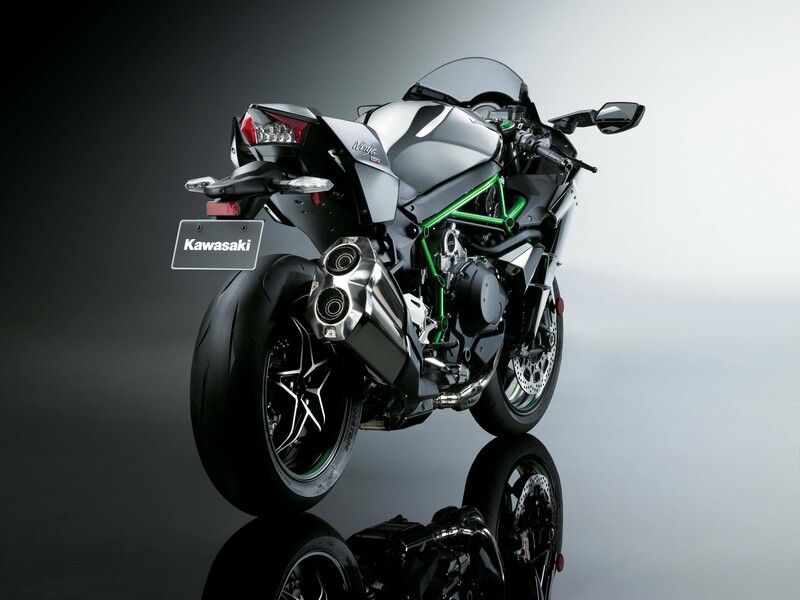 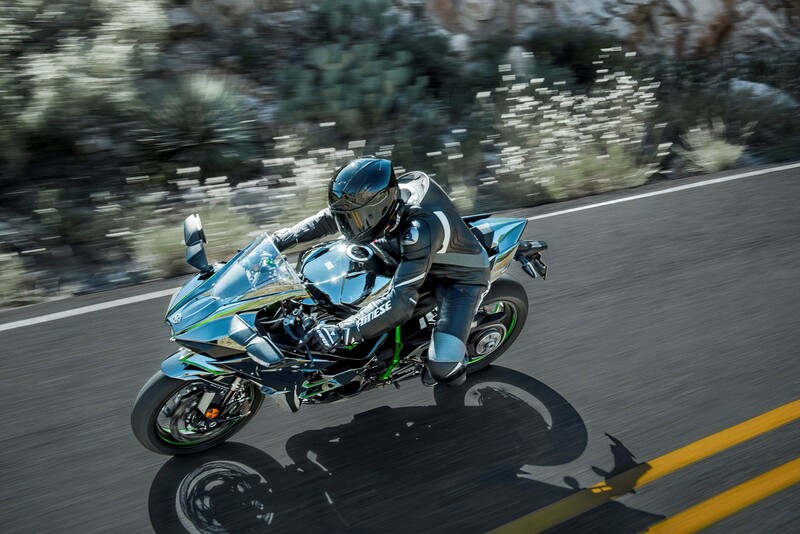 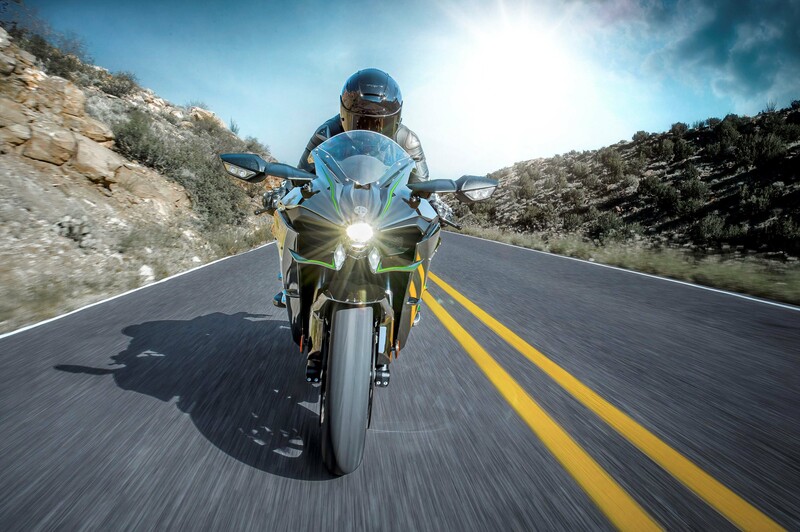 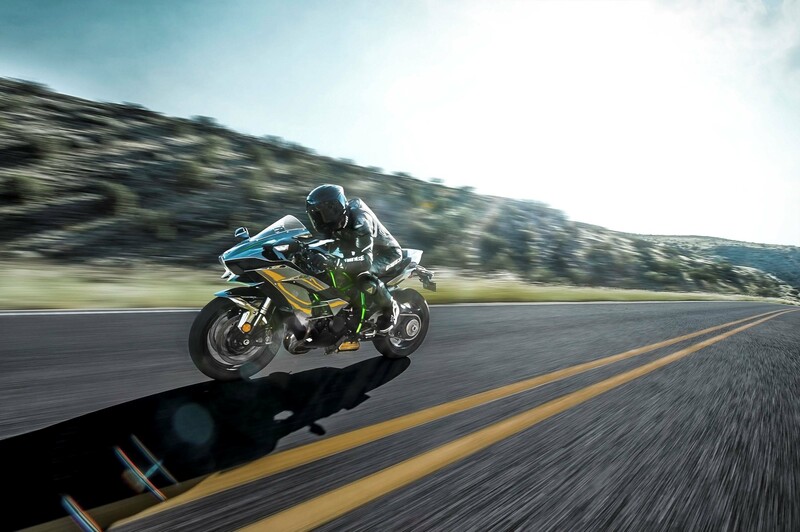 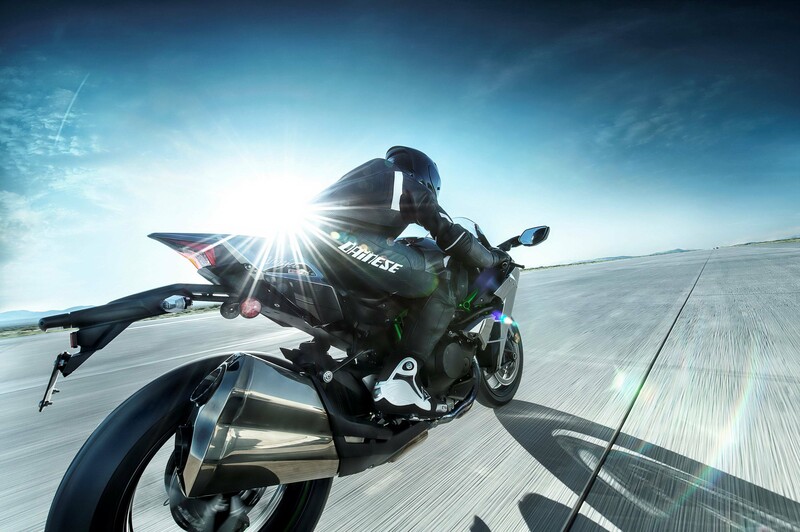 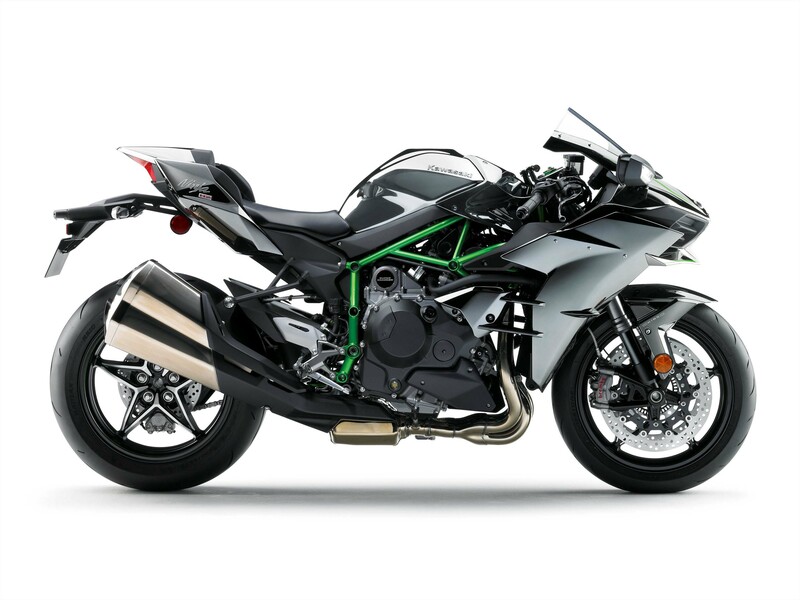 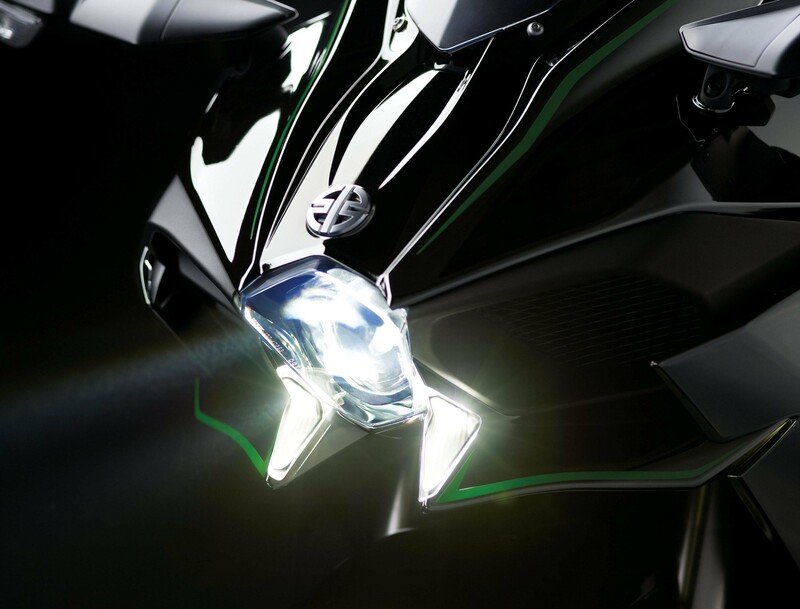 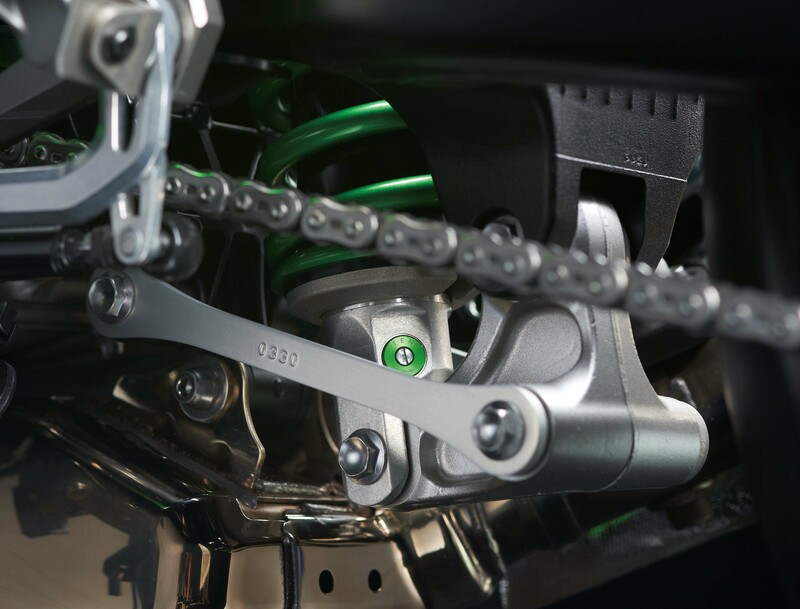 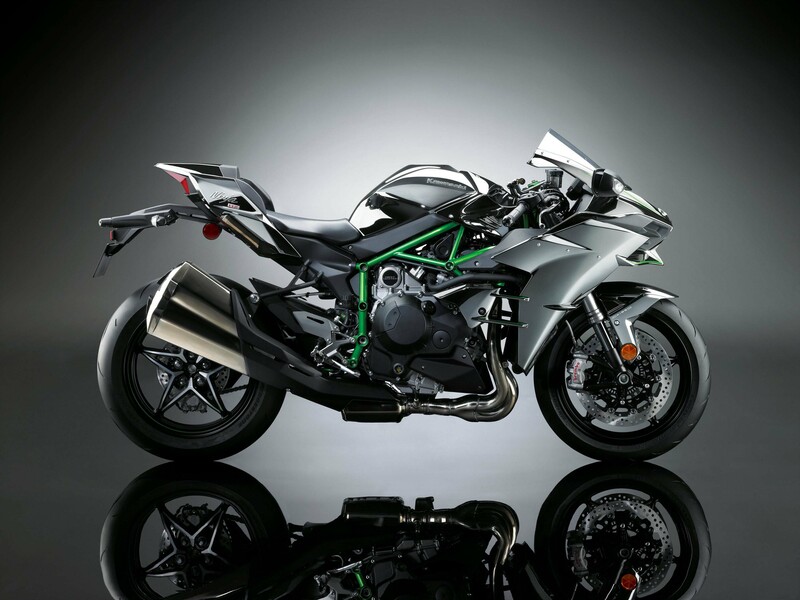 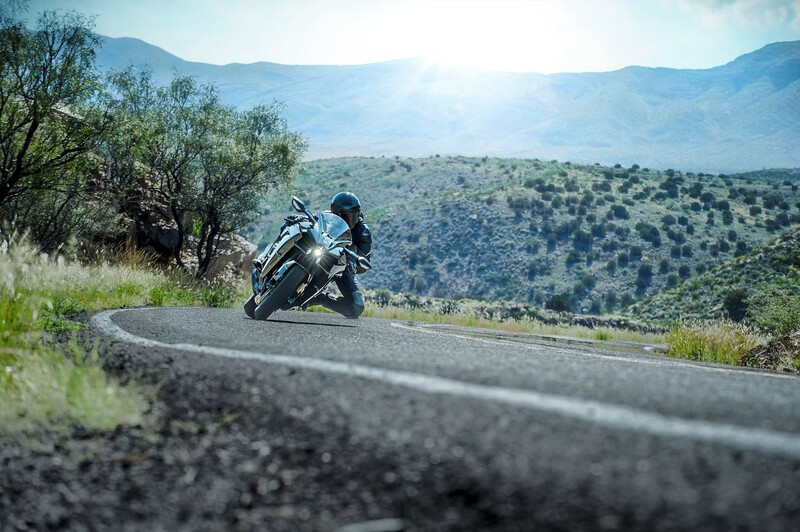 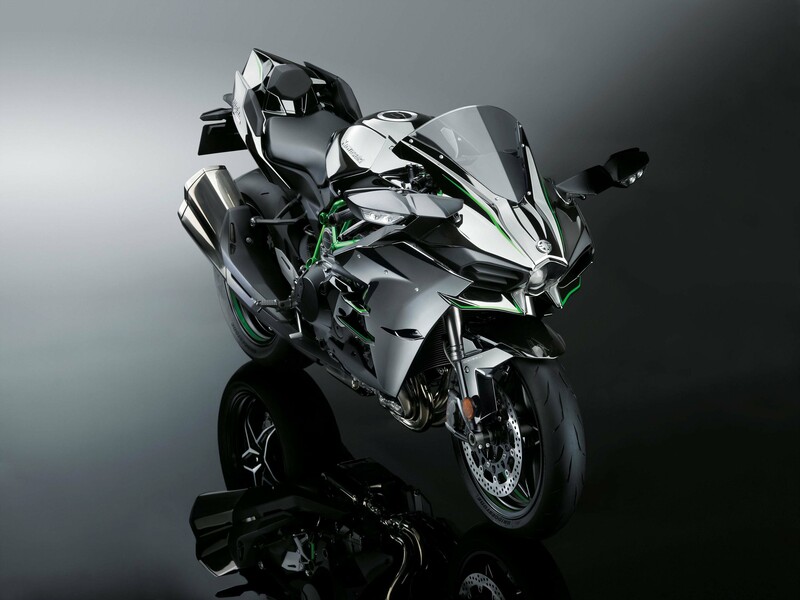 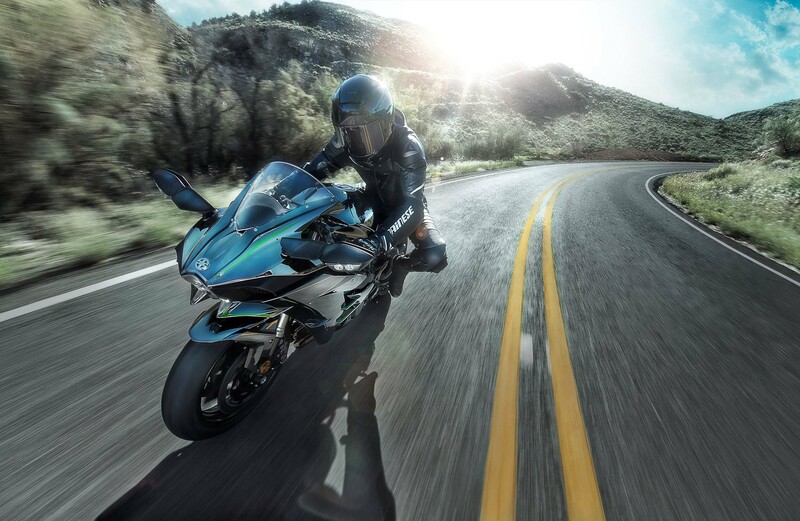 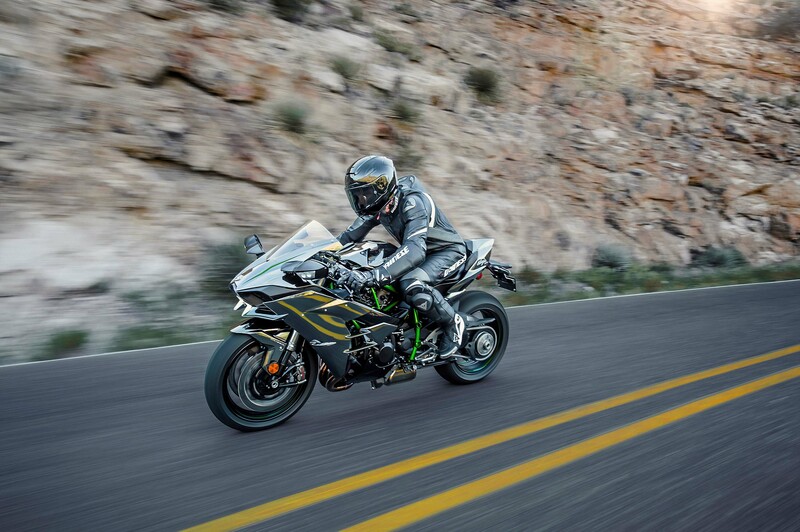 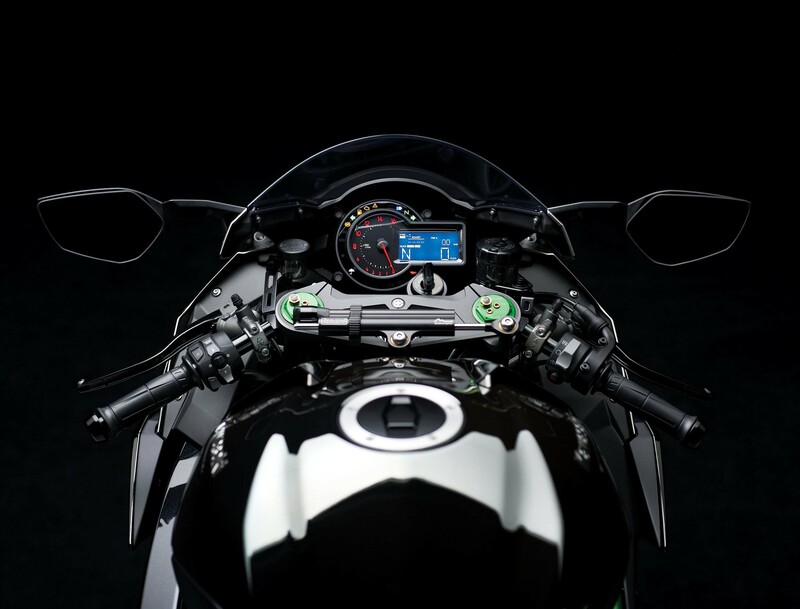 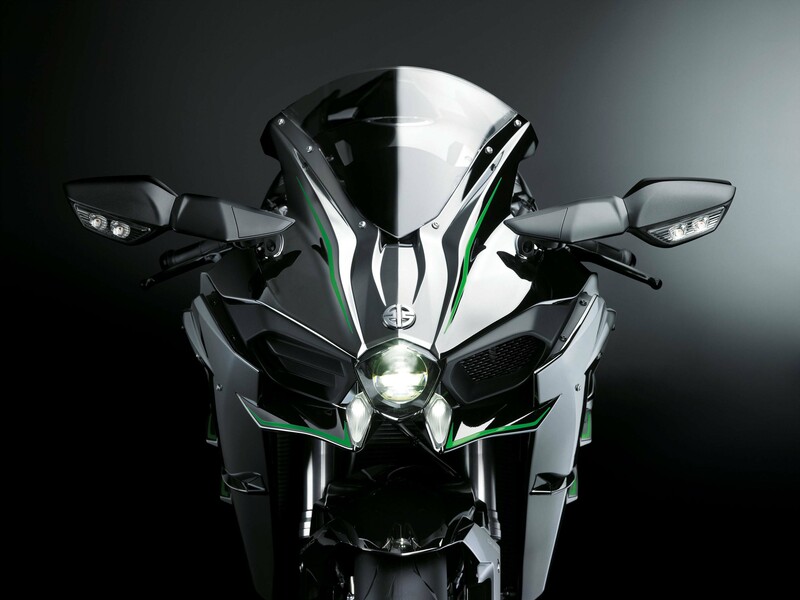 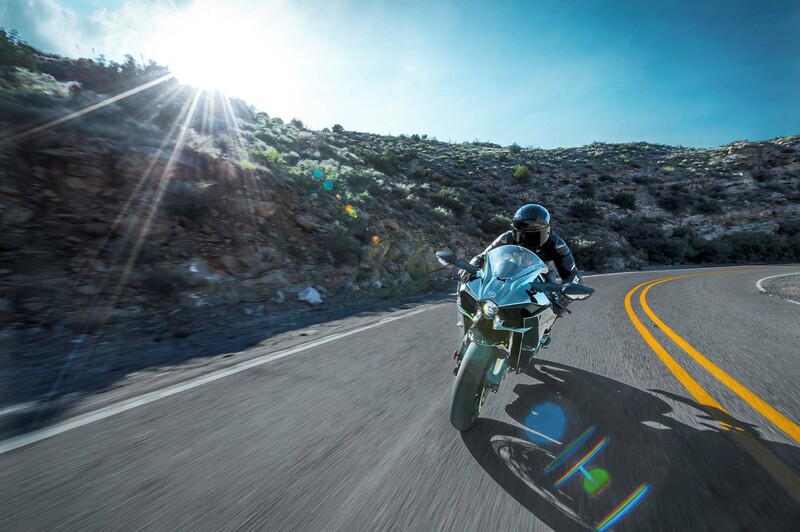 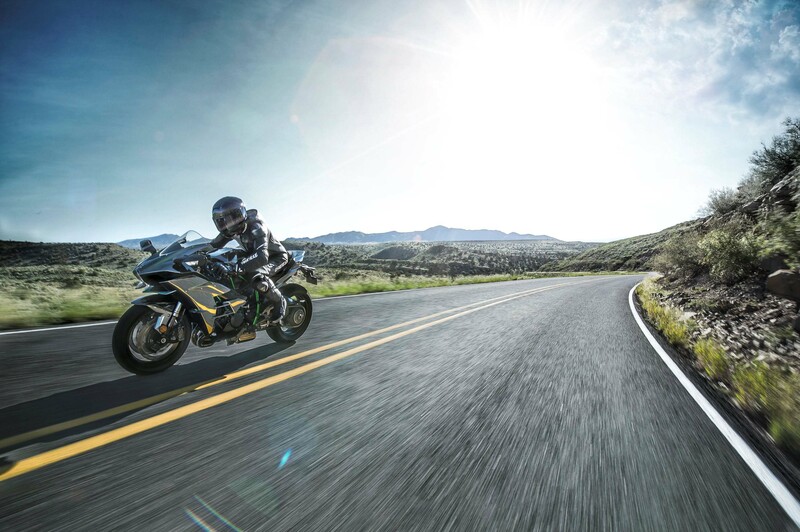 Kawasaki Ninja H2 – The Ultimate Street Bike? 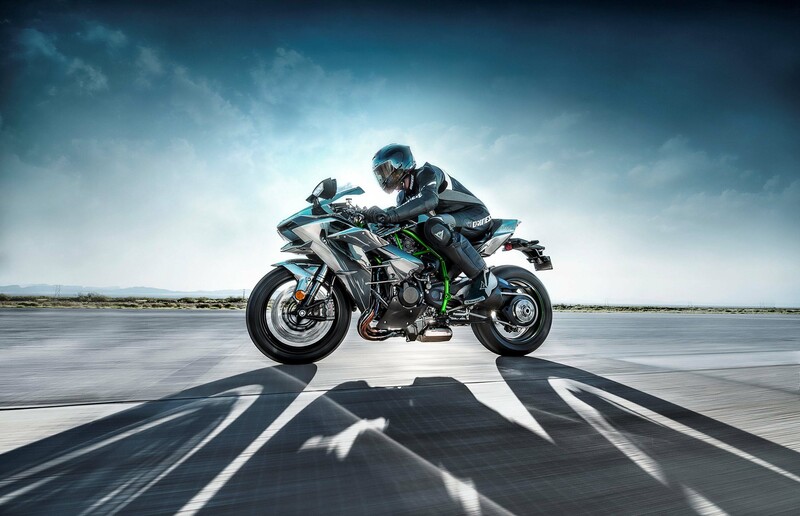 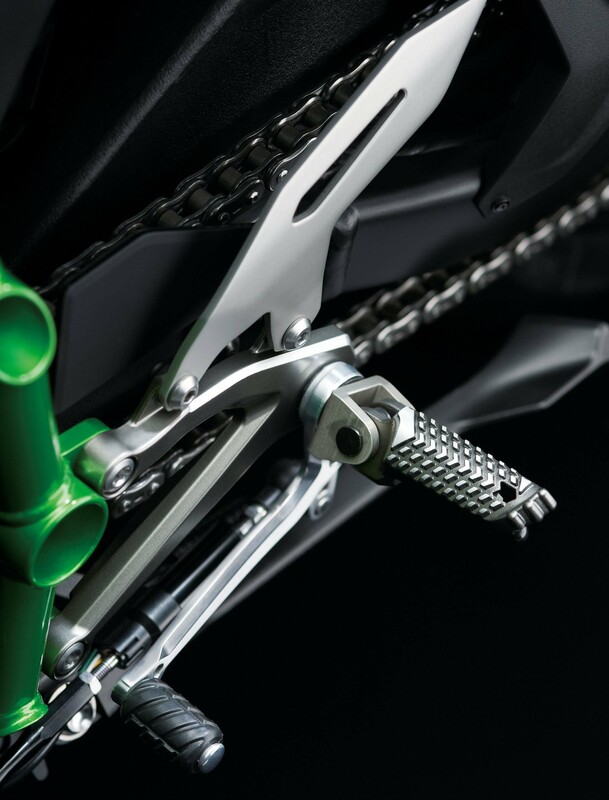 The Kawasaki Ninja H2 street bike has finally debuted at the EICMA show, giving motorcycle fans a glimpse at the road-going counterpart to the Kawasaki Ninja H2R track-only machine. 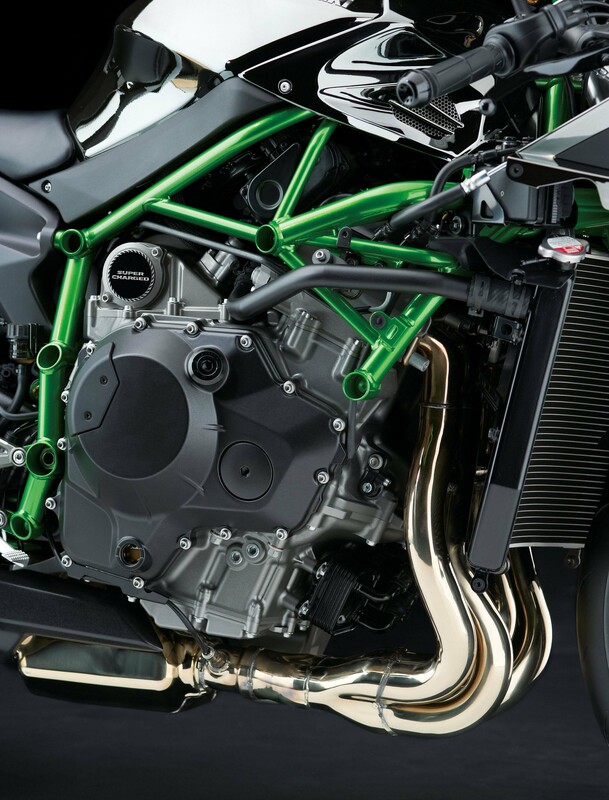 Based around the same 998cc supercharged inline-four engine, the Kawasaki Ninja H2 makes an astonishing 207 hp with ram air, 197hp without. 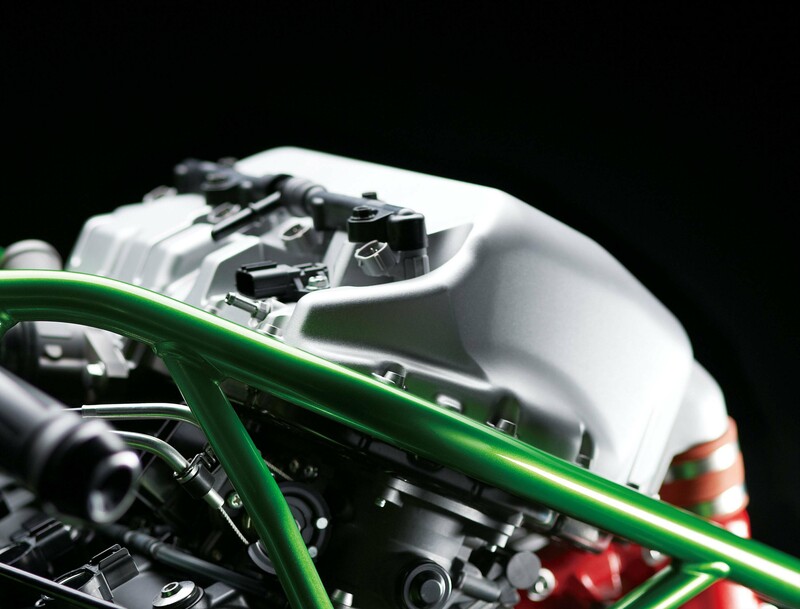 For reference, the Ninja H2R makes 305hp, without ram-air. 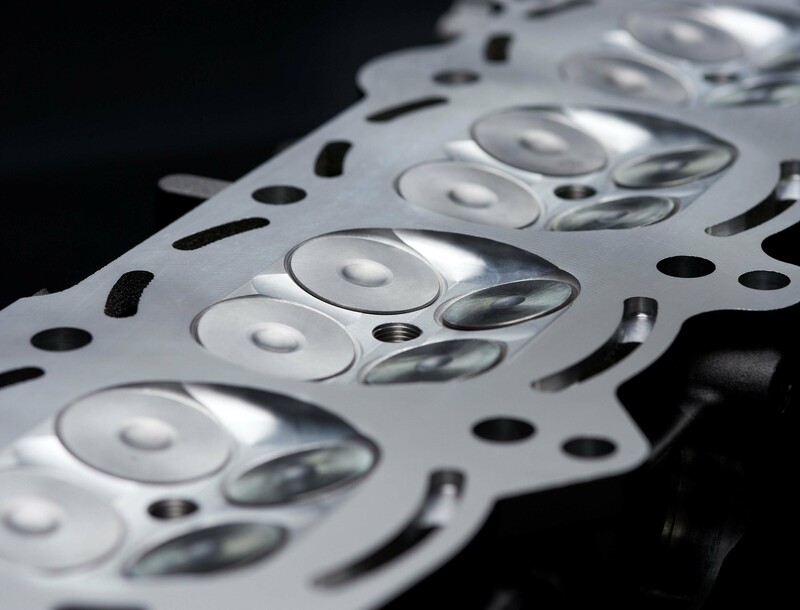 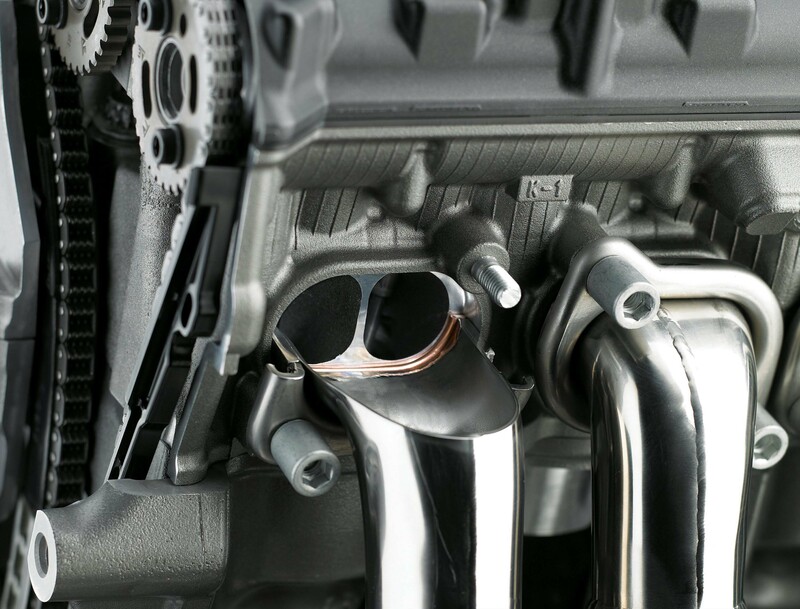 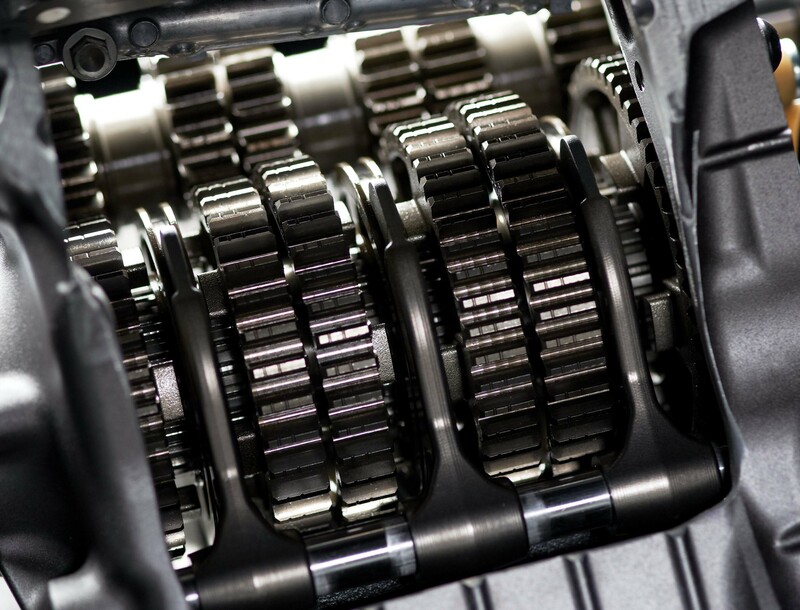 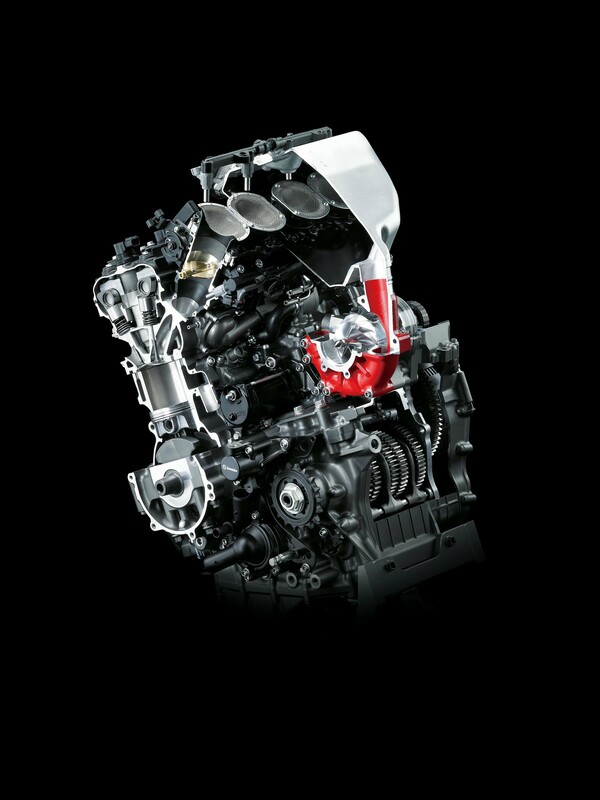 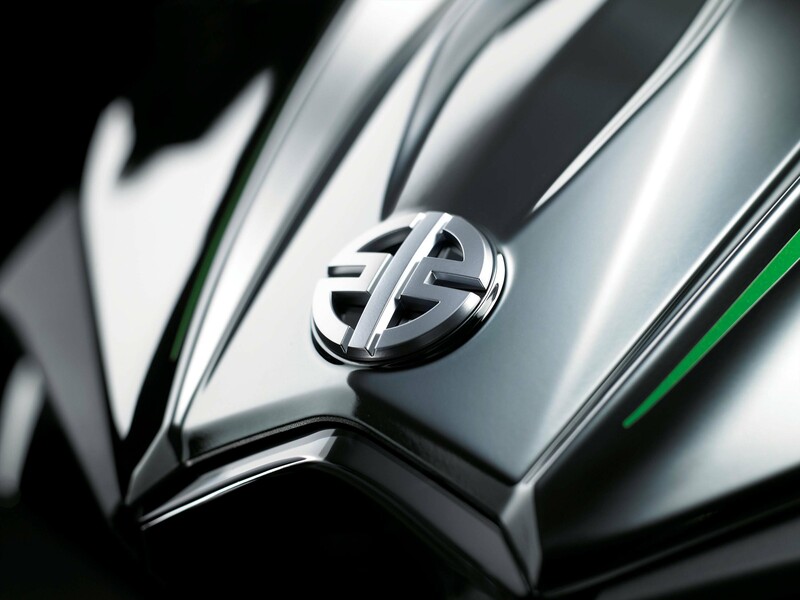 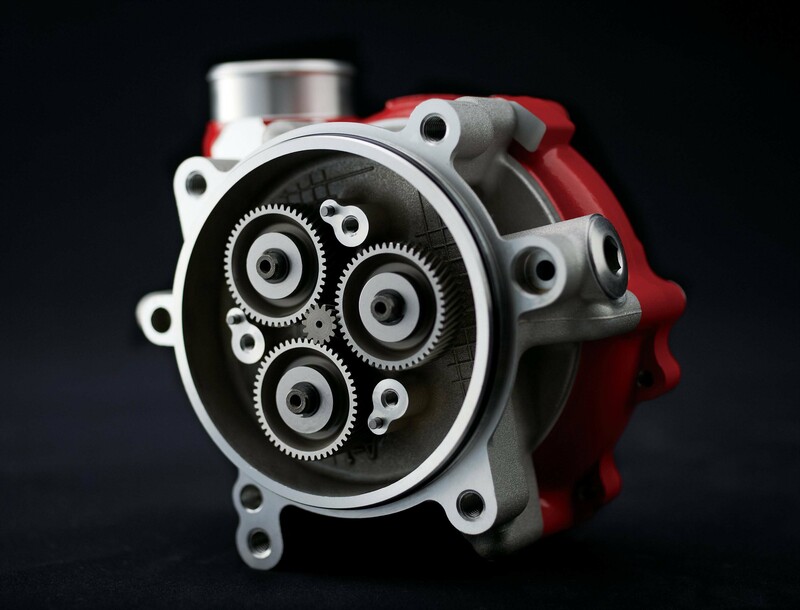 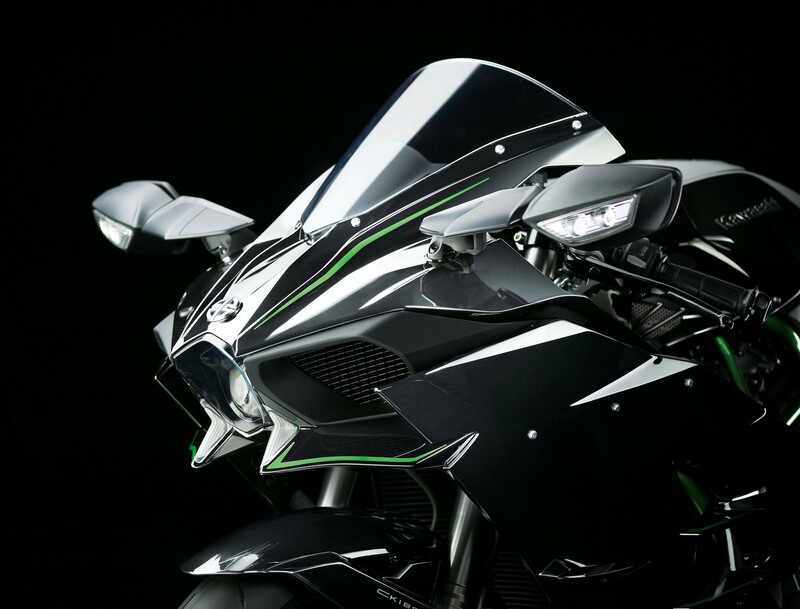 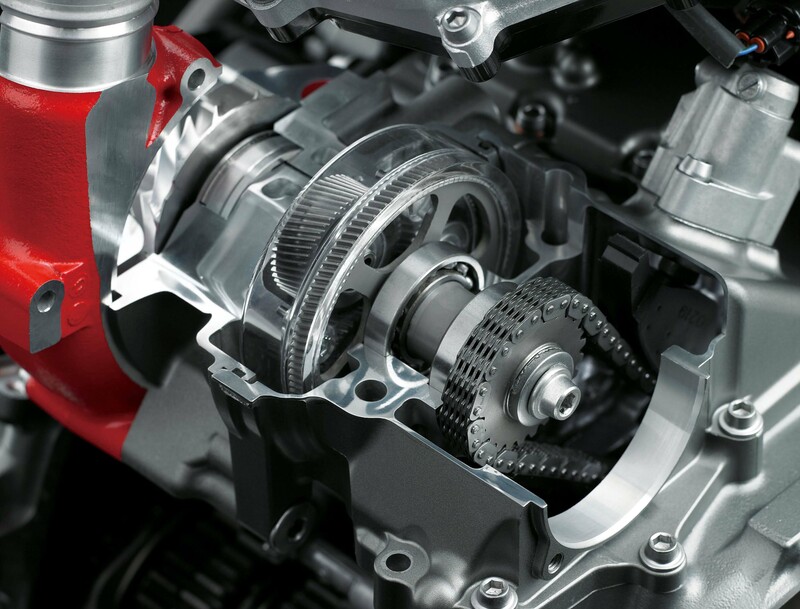 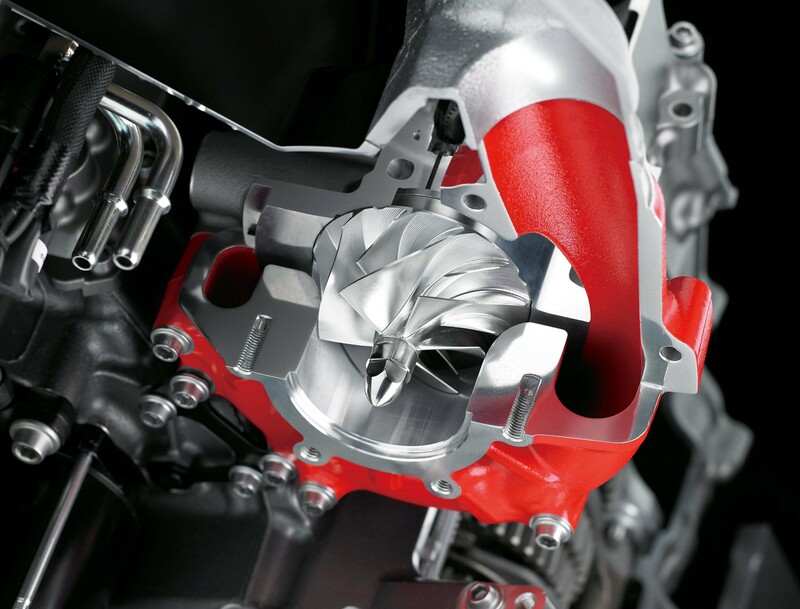 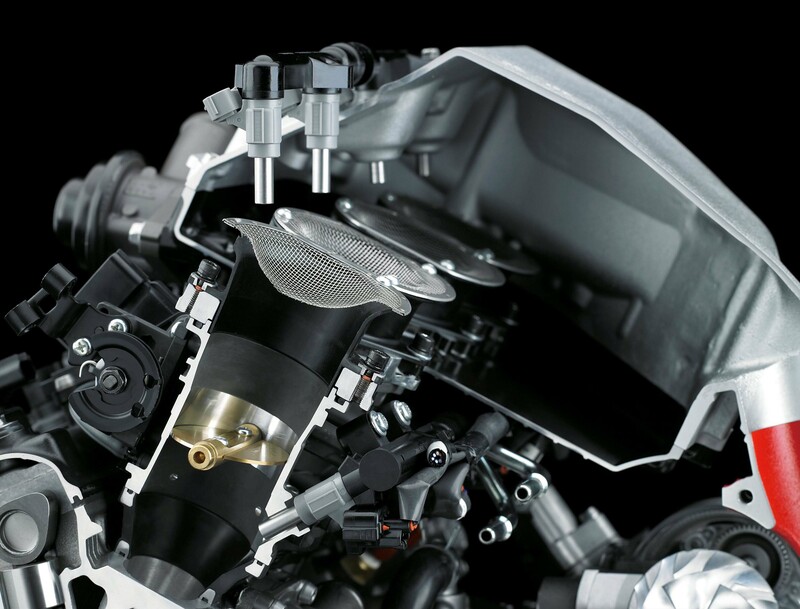 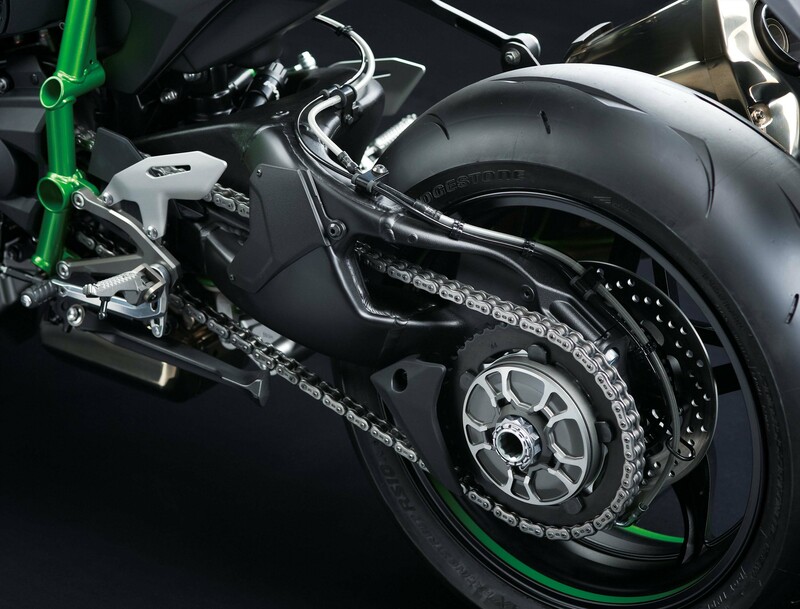 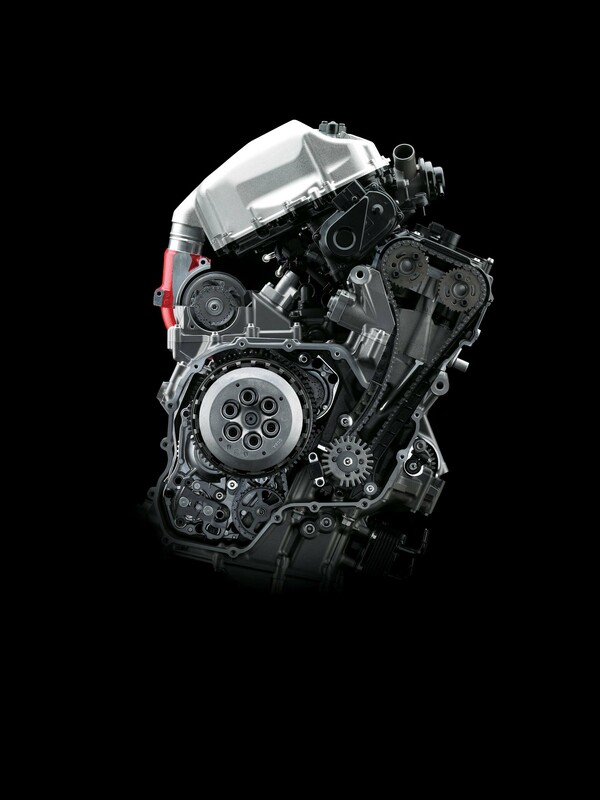 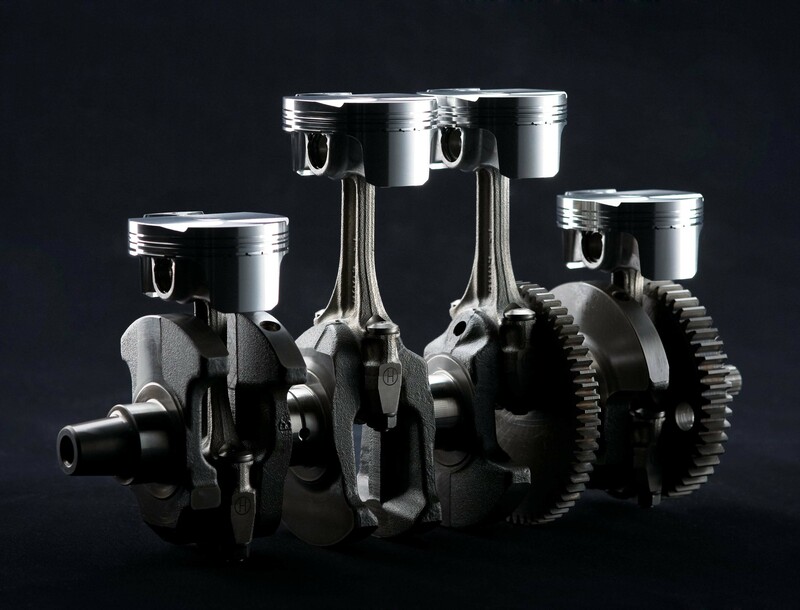 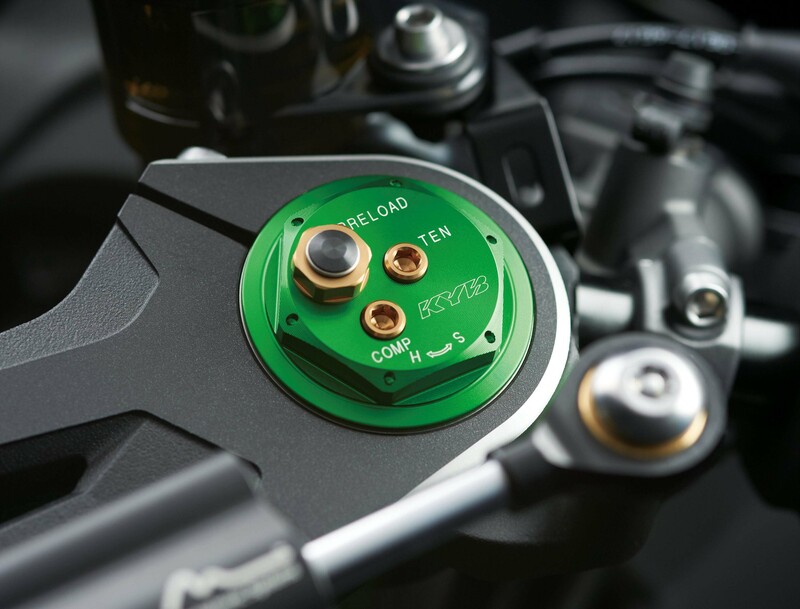 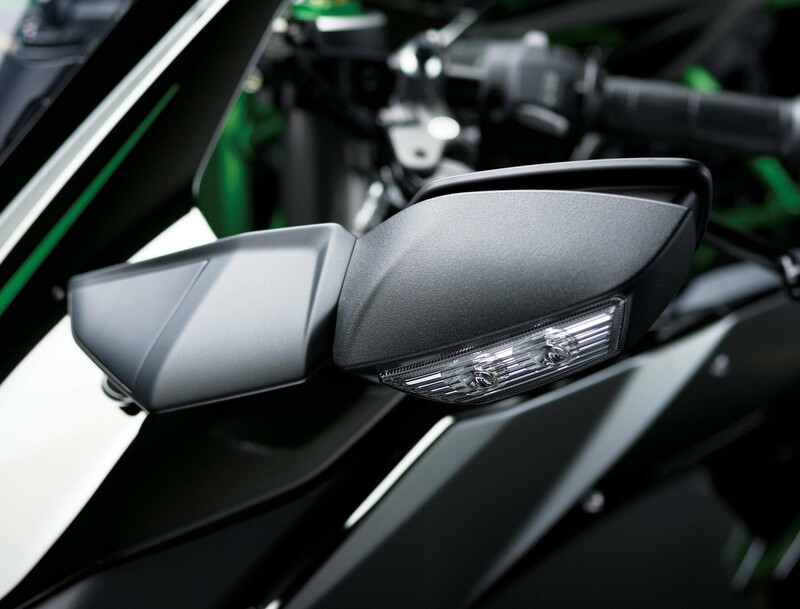 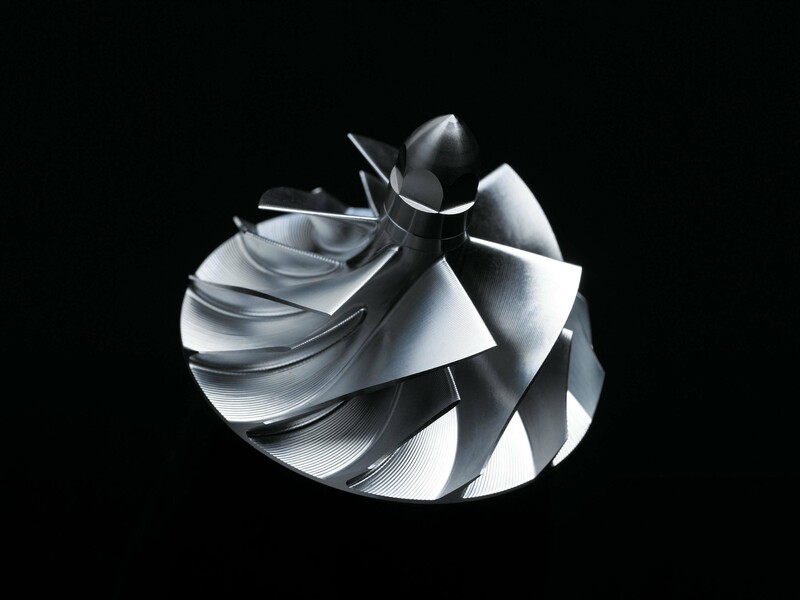 Kawasaki has designed its supercharger system to have two-step gear-ratio, allowing for maximum boost and low and high engine speeds, and the supercharger impeller reaches 130,000 rpm when the Kawasaki Ninja H2 is at its 14,000 rpm redline. 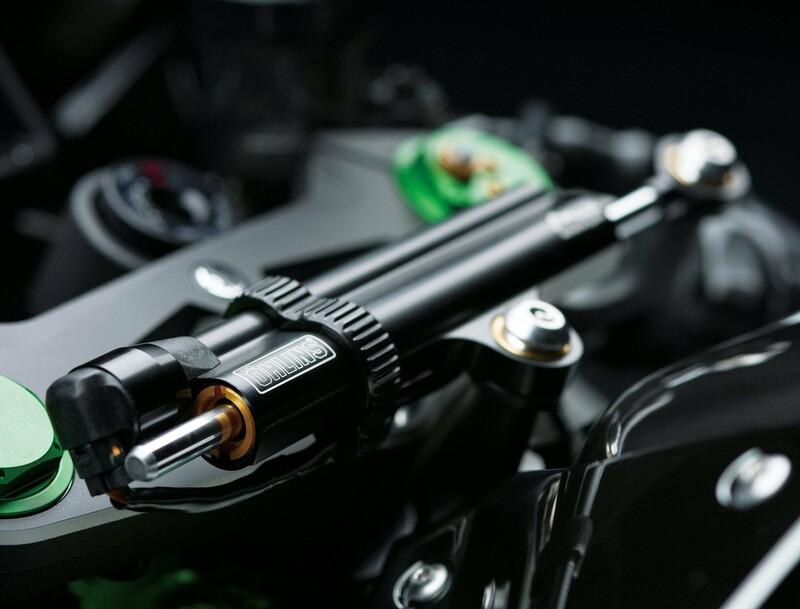 Peak torque is 98 lbs•ft, at 10,500 rpm, with the supercharger primarily helping to broaden the powerband for better street riding. 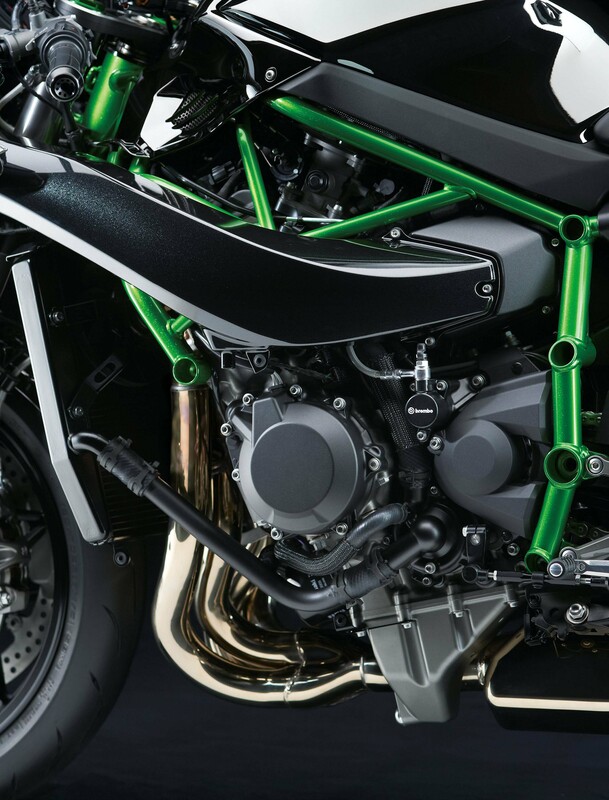 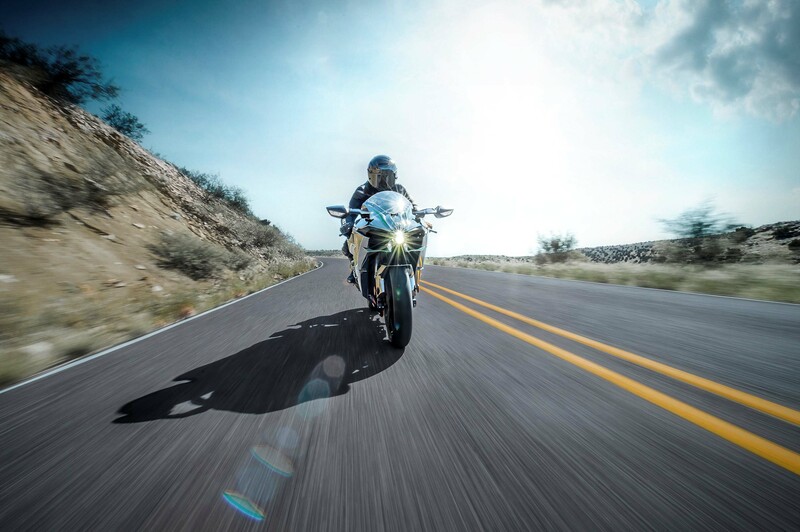 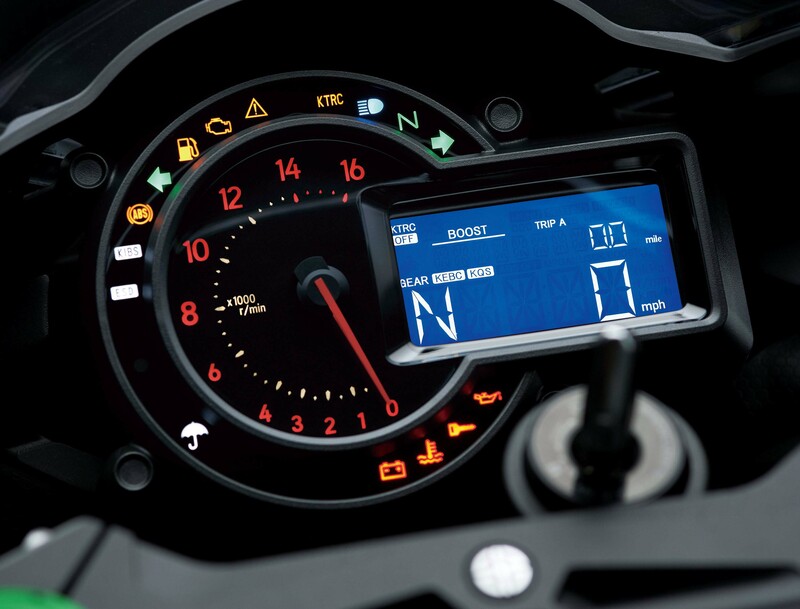 With the two bikes nearly identical, the street bike carries over the same suite of electronics found on the H2R as well: traction control (KTRC), launch control (KLCM), engine brake control (KEBC), anti-locking brakes (KIBS), quick shifter (KQS), and an eletronic steering damper by Öhlins. 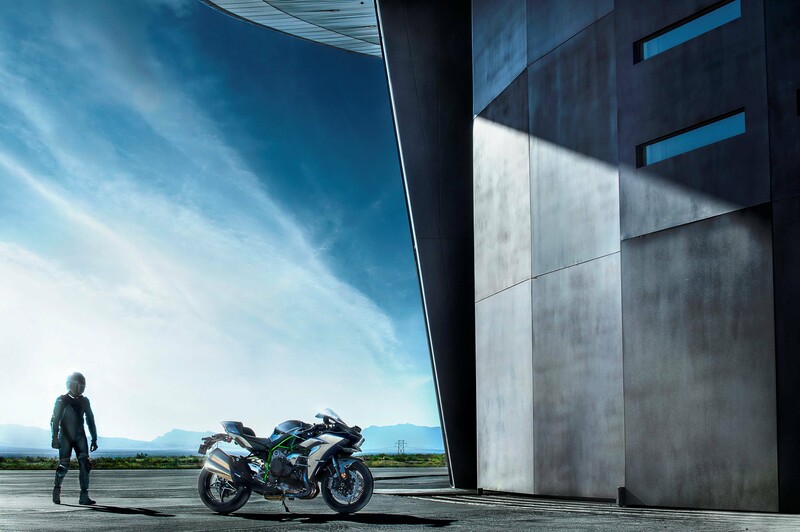 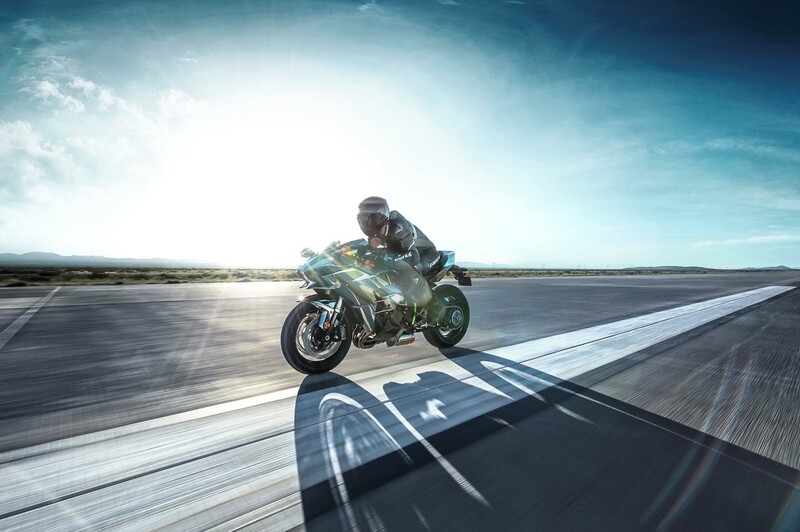 At 524.7 lbs at the curb, the Kawasaki Ninja H2 isn’t exactly the lightest superbike to ever grace our pages, though we doubt many riders will notice the heft when tapping into the supercharged power that’s on-board. 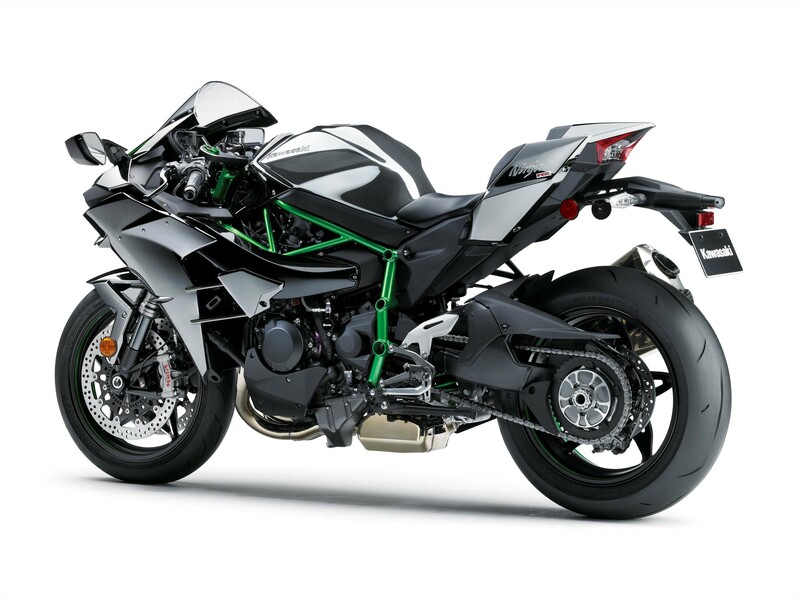 We also doubt that many of these machines will remain stock, meaning power figures in the 300’s will surely be possible, with little efforts. 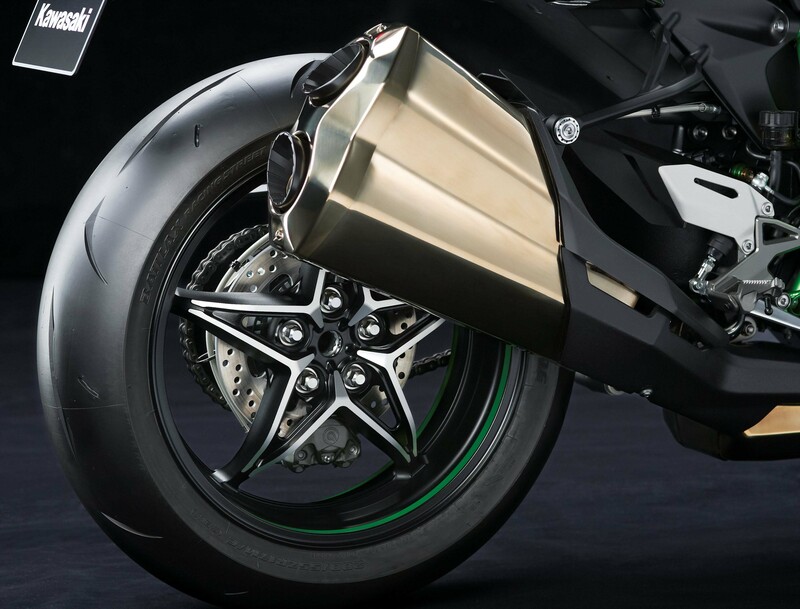 Other tidbits include fully adjustable suspension by KYB, front and aft; and brakes that are done by Brembo, with 330mm rotors up front, and a 250mm disc in the rear. 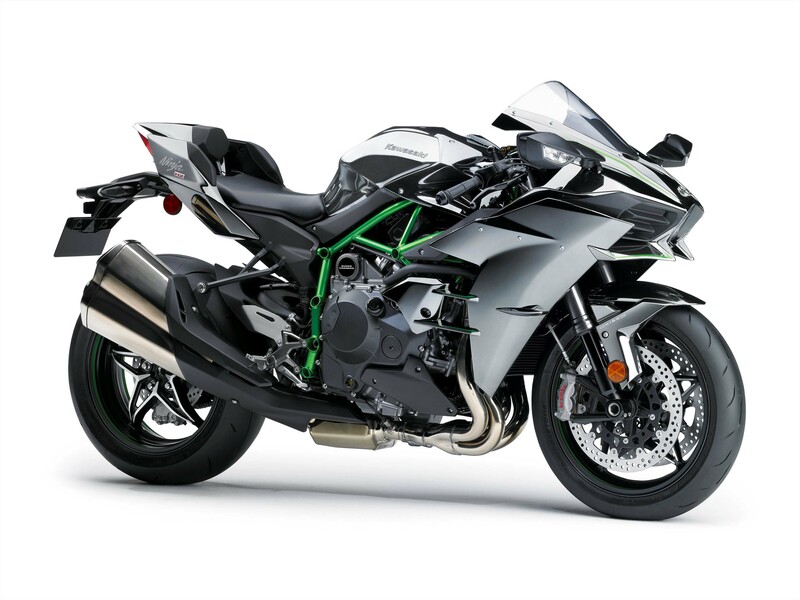 Available in limited numbers only, interested buyers will have to stop by their local Kawasaki dealership, and put down a deposit towards the $25,000 price tag. 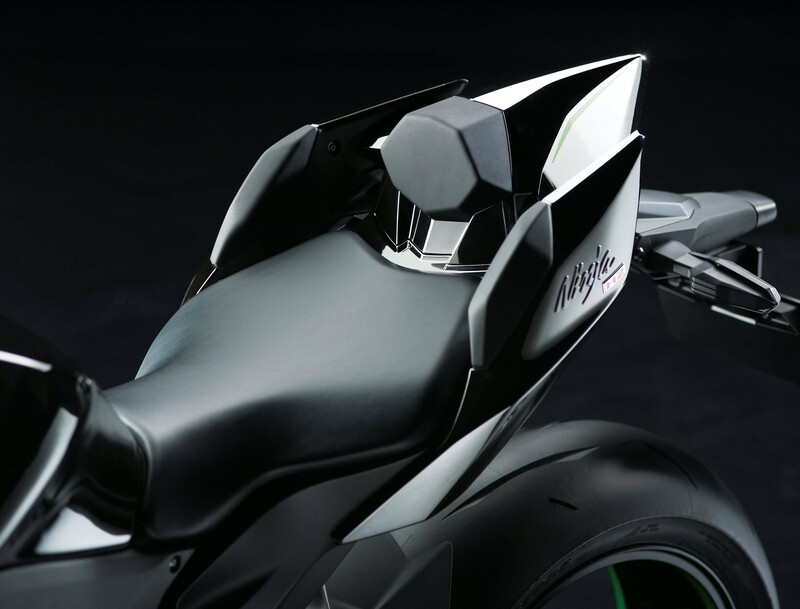 Sorry, there is room for only one rider on the Ninja H2, and no pillion seat is available. 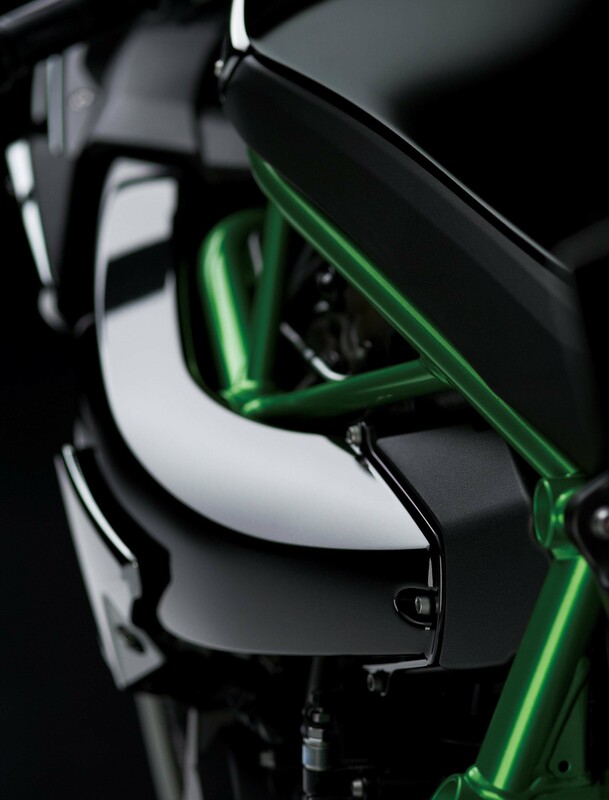 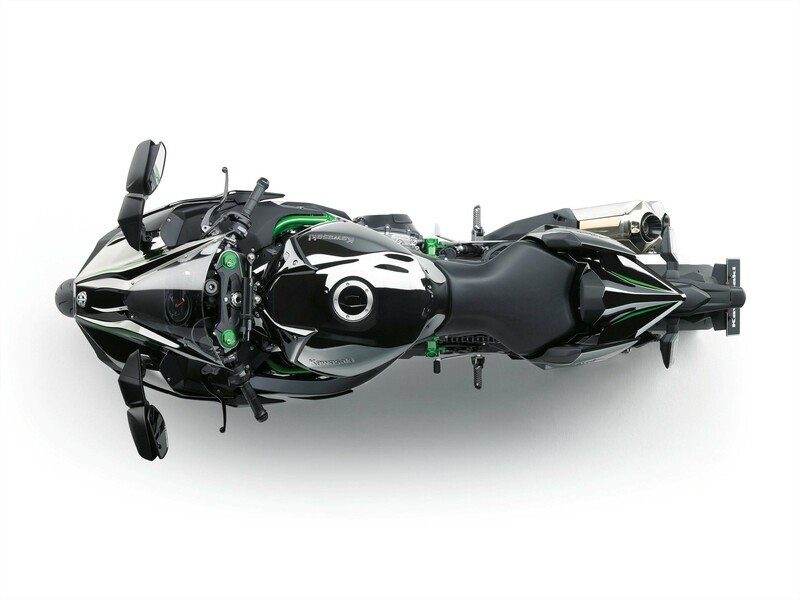 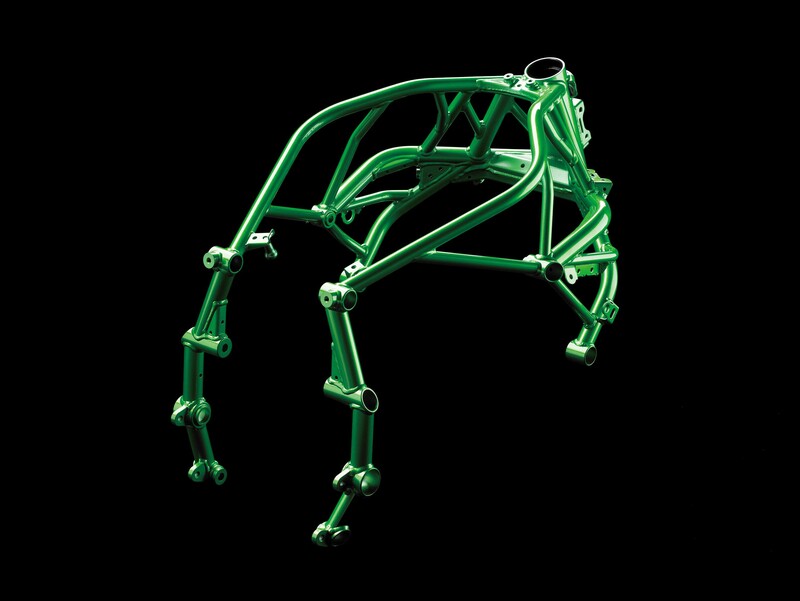 Wholesale Distributor Kawasaki Motors Corp., U.S.A.
Be sure to stay up-to-the-minute, and not miss a single bike release, with all our EICMA coverage. 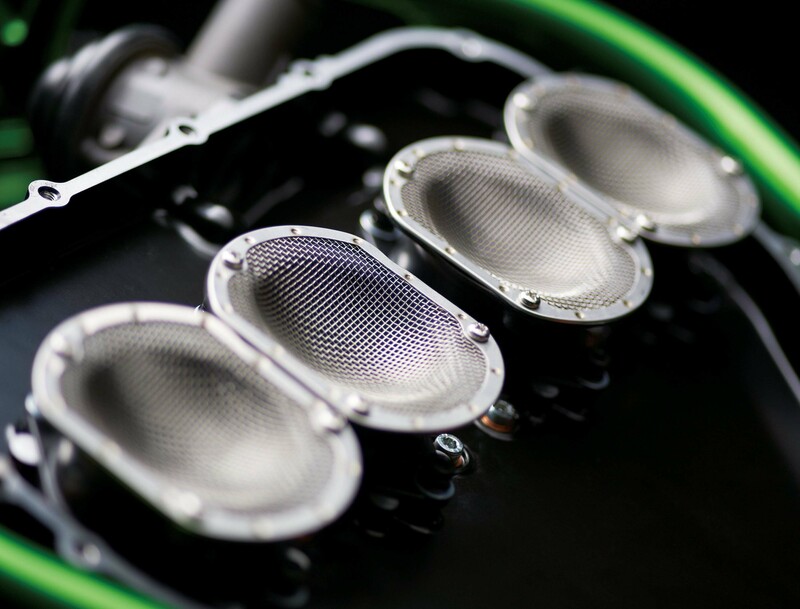 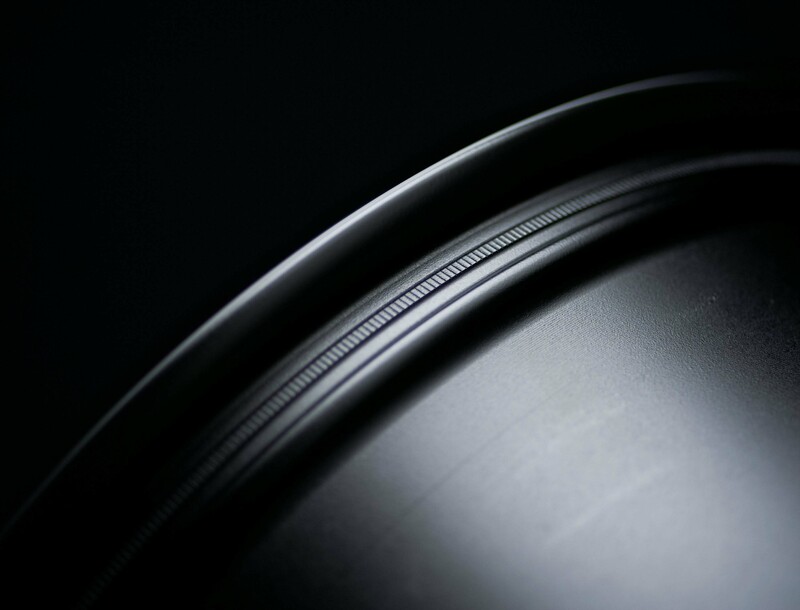 You can also follow Asphalt & Rubber on Facebook and Twitter.